Research has been reported to show a relationship between the amount of time spent sitting on a daily basis and rate of disease and morbidity. It also shows the length of time spent uninterrupted (that is without getting up and moving) to be a factor. Now there are reports of research that concludes the links are weak. What are we to believe and more importantly what are the best habits we can form to support our health and longevity? What does science say about prolonged sitting? Most researchers agree that the inactivity causes chronic illnesses, and it could lead to premature death. In fact, there is evidence that indicates that premature death is 8 times more likely to occur among people who generally lead sedentary lives than those who are generally physically active. In these studies, the term sedentary is broadly defined, and it refers to all the time that is spent sitting on the sofa, driving or riding around, and working behind a desk. 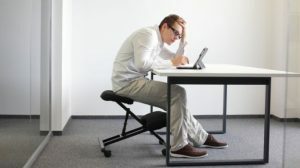 A study done in the US found that most grownups spend close to 10 hours sitting, and the negative health implications of this prolonged period of inactivity could not be canceled out with an entire hour of exercise.